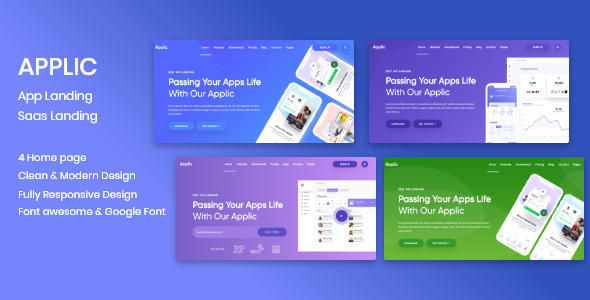 Applic – App Landing and SaaS Template. Applic – App Landing and SaaS Html Template. is a Responsive HTML5/CSS3 Template based on Bootstrap. Its easy to use and navigate as well. Compatible with Desktop,Laptop,table,mobile or any device. Applic is simple and clean design, will give your business / Marketing a professional looks. With Smooth TRANSITION and Effect it increase the beauty of your site. Its good for Any Marketing Company,App Business,Agency,blog even for a personal portfolio. Suitable for anyone who is looking for app, app landing, app landing page, app landing template, App Showcase, app store, app template, app website, clean app landing, creative app landing page, landing page, mobile app landing page, modern app Landing, parallax, Simple App Landing Templates.